t*rexes and tiaras: Tuesday Titles 138.. When I was in Paris, one of the places on our itinerary was Shakespeare and Company; an English bookshop just across the river from Notre Dame. And I bought this, predominantly because the other three were all reading a copy whilst we were in Paris and it seemed like a cute thing to do. Plus, Alex assured me that it was great and she's usually a pretty decent authority on books. Frankly, she was absolutely right. I loved it. For some reason, although I got home and was about halfway through, I'm not sure why it's taken me so long to finish (apart from the few weeks I'd left it at a friend's house, which didn't help). Because, I really enjoyed every page. Rosemary takes a job on a small space ship which basically creates wormholes in space for others which follow. The ship's crew is made up of some colourful characters and there's so much description of the different species and their emotional interaction with one another. I almost found it a little hard to keep up with who was who and what. Rosemary has a secret, which she's hoping she won't ever have to share. Surely escaping from her home planet is what she needs and this new job gives her the chance to leave her old life behind. But things have a way of catching up with us and even travelling to the other end of the stratosphere isn't quite far enough. It was impossible to grow up in my house and not develop a bit of a love of science fiction; my mum is a sci-fi and fantasy reader to the end. And this, I'd say, fits in pretty well to that genre, if a little more approachable than a lot of others. I absolutely wanted to be part of this world, a crew member on the Wayfarer and am definitely keen to read the next books in the series. 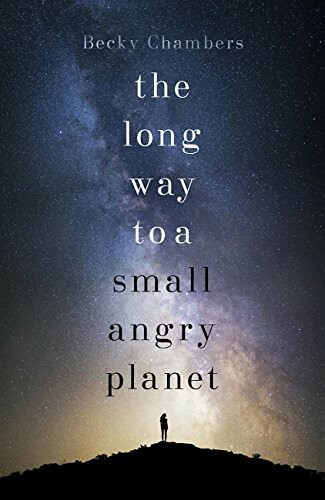 Honestly, I adored it and would recommend to any reader, whether they'd consider themselves a space opera fan, or not. I've just finished reading my second Kate Shackleton mystery book, it was great! Just added this to my Amazon wish list! This is THE best book ever, I'm so glad I let Alex talk me into reading a sci-fi novel. The second in the series is equally brilliant.